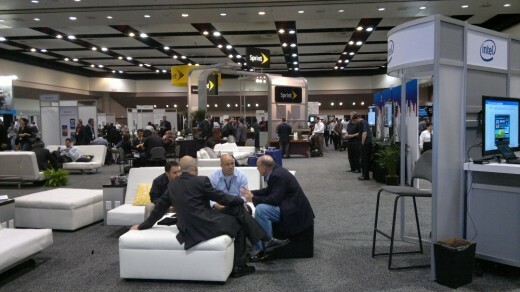 I spent the last few days at Sprint’s Open Solutions Conference and came away impressed with the way the wireless operator is working with developers and entrepreneurs who are building machine-to-machine (M2M) services on top of the Sprint network. M2M refers to automated data communication between devices. M2M devices typically aren’t phones. Well know examples include the connected Kindle and “smart” power meters, but there are hundreds of other ways M2M is being used to in business, technology and for fun hacks. I spoke to nearly a dozen small to large companies that had built successful businesses using M2M on the Sprint network. Several of them raved about the support they got from Sprint’s developer and emerging solutions programs while creating and bringing their products to market. 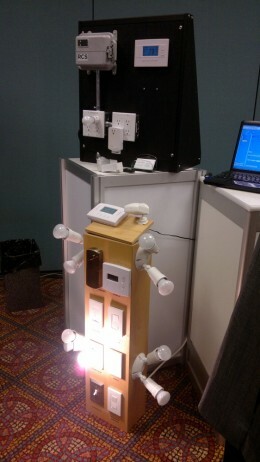 Here are a few examples of M2M products I saw at the conference. Universal Devices‘ line of “Smart Grid” controllers (image, right) that lets you remotely control machines, adjust thermostats and control lighting in your house or business. Fleet vehicle management systems from Applus and Trimble that not only track vehicles but also monitor driver behavior and report things speeding, and agressive cornering. Applus has a consumer version of their A+ Tracker that you can use to monitor your teen’s driving. Omnilink tracks assets using small devices that can fit into a bank’s money bag deliveries or travel along with truck cargo with a high risk of theft like cigarettes or fashion apparel. The same technology, using a pocketable or clip on fob instead of a bracelet, is being used to keep track early stage Alzheimers patients. Omnilink also manufactures the ankle bracelets (image below, right) that some parolees have to wear. I was surprised to hear that, in the industry, tracking felons is considered just another form of “asset” tracking. Cernium‘s CheckVideo product does “smart” monitoring of video survaience cameras. 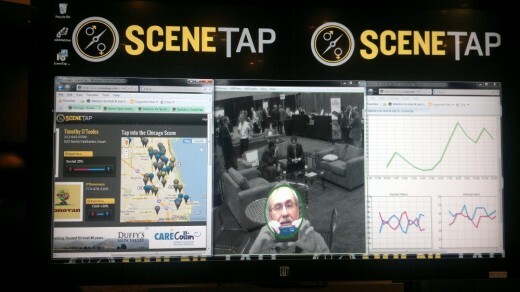 Software monitors the video stream and detects fire, flooding or a person within a secure area. When it detects a problem it sends a text or email alert with a link to a video clip of the suspicious activity to a security company or to the property owner. Monitoring of fuel and other tank levels which was demonstrated on the show floor with the “Connected Beer Keg” (image, below) which served up free draughts of beer to conference attendees while the keg’s temperature, beer levels and rate of depletion were wirelessly monitored using a Bug Labs module running from Axeda. The software can even call for a beer delivery when supplies are running low. Several vendors were showing their solutions for remote control of digital signs. Intel is taking this to a whole new level with its AIM (“Audience Impression Metrics”) Suite software which analyzes a video feed to determine the gender and approximate age of the people in the video. AIM is used for things like changing the product pitch of retail advertising display to reflect the demographics of the people viewing it. An interesting use of AIM is SceneTap, (image below) a web site that lets you find nearby clubs and bars and view the size, age and gender makeup of the crowd and whether people are arriving or leaving. Ideal Life does health monitoring with wearable and bedside devices and with workplace kiosks that check fleet driver’s and other worker’s blood pressure and other vital signs when they report to work. 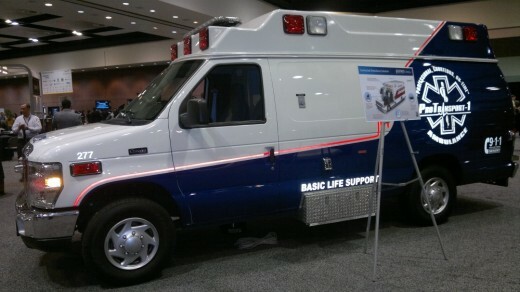 The Open Solution’s conference floor was dominated by the “Connected Ambulance” which collects an in-transport patient’s vital signs and wirelessly transmits them to emergency room doctors. It’s a real ambulance in service with San Francisco Bay Area ambulance company ProTransport-1. The wireless telemetry hardware and software integration is by Feeney Wireless. Sprint sees a huge oportunity in M2M and is committed to helping M2M developers . Danny Bowman, President of Sprint’s ‘s Integrated Solutions Group, says there are 62 million M2M devices in service today. He expects that number to grow by 36% to 52% per year with 2.1 billion in use by 2020. Sprint is developing a reputation as the M2M leader among US mobile operators and is racking industry awards including winning Frost & Sullivan’s 2011 Customer Value Enhancement Award in North America for Machine to Machine (M2M) Communications report (PDF report) and ranking #1 in North America and #2 in the world (after VodaFone) in Analysys Mason’s 2011 Machine-to-Machine (M2M) Scorecard for Communications Service Providers (PDF report). Visit m2m.sprint.com to learn more about Sprint’s M2M programs. This entry was posted in Carriers and tagged M2M, Sprint, SprintOSC2011 by Dennis Bournique. Bookmark the permalink.